Grey is a Reuters reporter who has previously written books about the UK-US military campaign in Afghanistan and the CIA’s rendition programme. 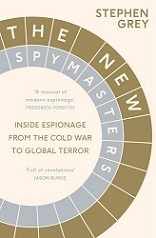 He has now turned his attention to espionage, and the result — revelatory, deeply informed and subtle — is an antidote to any view of the intelligence agencies as being all-knowing or, conversely, all over the place. Their world…is a dark one, but one in which agents can sometimes discern flashes of colour that offer clues, leads and, sometimes, a licence to kill….Grey’s book reveals above all the relentless uncertainty of spy work, beset with human error and technological over-optimism. NewSpymasters was rated the No 1 Bestseller in Non-Fiction in London by the Evening Standard on July 2nd. 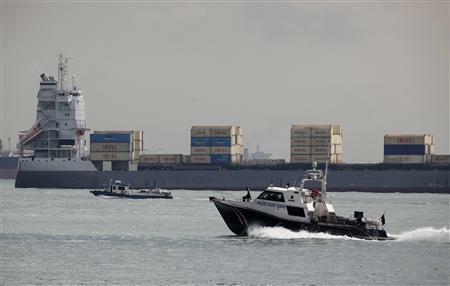 SINGAPORE (Reuters) – Just before noon on a sticky, overcast Saturday morning earlier this month a truck carrying two white containers waited at an electronic checkpoint to leave Singapore’s main port. The containers bore the bright red letters IRISL, the initials of Iran’s cargo line, which has been blacklisted by the United Nations, United States and European Union. Anchored just off Singapore’s playground island of Sentosa that same day, the container ship Valili was also stacked high with IRISL boxes. A couple of miles to the east the Parmis, another container ship, also carried IRISL crates. Shipping movements data tracked by Reuters shows the Parmis had pulled into Singapore waters from the northern Chinese port of Tianjin early that morning. The ships and containers are key parts in an international cat-and-mouse game, as Iran attempts to evade the trade sanctions tightening around it. Washington and European capitals want to stop or slow Iran’s nuclear program. They believe Iran Shipping Lines(IRISL), which moves nearly a third of Iran’s exports and imports and is central to the country’s trade, plays a critical role in evading sanctions designed to stop the movement of controlled weapons, missiles and nuclear technology to and from Iran. IRISL would not comment for this story. Last June the company said in an interview that there was no evidence it had been involved in arms trafficking. Iran says its nuclear program is peaceful and that IRISL has no links with any weapons program. Tehran complained vigorously last June when the European Union followed the United States with beefed-up sanctions that banned new contracts with IRISL. A United Nations resolution forces all states to inspect IRISL’s cargo. But many in the West hold up IRISL as exhibit A for Iran’s ability to evade sanctions because the shipping line regularly reflags its ships and changes their official owners. An analysis of shipping data sheds new light on that deception. Using data from IHS Fairplay, a ship tracking group that uses ship registration documents from various sources, and Reuters Freight Fundamentals Database, which compiles location data from every ship’s Automatic Identification System, shows that despite the sanctions 130 of the 144 banned ships in IRISL’s fleet continue to call at many of the world’s major ports hidden behind a web of shell companies and diverse ownership. Dozens of Iranian ships have used Singapore several hundred times in the past two years, for instance, as a stop-off on their way to other destinations such as China. The data shows that in the 48 months before U.S. sanctions began in September 2008, IRISL made 345 changes to its fleet including names, the flags ships sailed under, operators, managers and registered owners. In the 40 months since sanctions began there have been at least 878, including 157 name changes, 94 changes of flag, 122 changes of operator, and 127 changes of registered ownership. 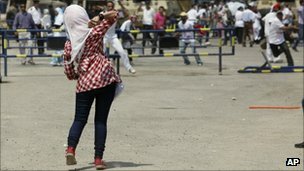 A UK firm offered to supply “cyber-spy” software used by Egypt to target activists, the BBC has learned. Documents found in the headquarters of the country’s security service suggest it was used for a five-month trial period at the end of last year. Hampshire-based Gamma International UK denies actually supplying the program, which infects computers with a virus that bugs online voice calls and email. The foreign secretary says he will “critically” examine export controls. Right or wrong, Britain did benefit from evidence obtained by from the CIA’s now-notorious programme of High Value Target (HVT) interrogation, the use of methods like waterboarding, sleep deprivation, confinement in boxes, and throwing prisoners against (specially-modified) walls. Libya says missing CIA prisoner "committed suicide"
ONE of the most important members of the Al Qaeda captured by the CIA in the months after 9/11 has been found dead in an alleged “suicide” in a jail in Libya, according to the country’s news media. Ibn Al Sheikh al Libi, a former Al Qaeda camp commander, was controversially sent by the CIA to Egypt as part of the agency’s “extra-ordinary rendition” program and was allegedly subject to extreme torture, returned back into CIA custody, and then transferred onwards to Libya. Described by former CIA director George Tenet in his 2006 autobiography as “the highest ranking al-Qa’ida member in U.S. custody” just after 9/11, al Libi was captured by the CIA before the agency had established its own secret prison program. And he was one of a handful of the most senior Al Qaeda leaders in US custody that were sent for interrogation at the hands of foreign countries. Continue reading Libya says missing CIA prisoner "committed suicide"
Posted on May 12, 2009 November 26, 2009 Author stephengrey1Categories "War on Terror", CIA, Intelligence, Rendition, Secret PrisonsLeave a comment on Libya says missing CIA prisoner "committed suicide"
Prisoner No 1458 at Guantanamo Bay, Cuba, woke up each day last week in his solitary cell and waited for the inevitable: the arrival of a team of guards to take him down the corridor in shackles to be painfully force fed through a tube. This was not another attempt to extract a confession, but an attempt to keep Binyam Mohamed alive. The 30-year-old former resident of Notting Hill, west London, was continuing his hunger strike against what he sees as failed promises to set him free. When he last saw his lawyer two weeks ago, his arms, she said, stuck out of his 6ft body “like little thin twigs”. Although previously accused by US authorities of plotting a terrorist attack on American soil, Mohamed has not been charged with any crime. His former military prosecutor declared a month ago that he presented no threat to either America or Britain. After losing almost 50lb in weight, and wasting further by the day, he was probably in no state to be told or even to care that two High Court judges in London last Wednesday were appealing for the public release of “powerful evidence” that might help prove his astonishing claims of mistreatment to be true. The issues at stake, said the British judges, were nothing short of the lofty interests of “law, free speech and democratic accountability”. BBC Newsnight broadcast a film by me with new revelations about the spy whose evidence, more than any other, provided the intelligence case for the Iraq war. We find Rafid Alwan, aka Curveball, in a town in Germany; and discover just how many doubts existed about Curveball – before the war – among both US and British intelligence. A senior British Army officer has hit out at the lack of protection given to his former translator after the man was forced to go on the run when Iraqi insurgents murdered his brother-in-law and kidnapped his wife. Last night, Lieutenant Colonel Nicholas Mercer, who was head of the Army’s legal service in Iraq, said Britain had an obligation to help Haider Samad. Lt Col Mercer said Samad had been crucial to his work in establishing law and order after the British took over in southern Iraq. “We couldn’t have done it without him,” he said.